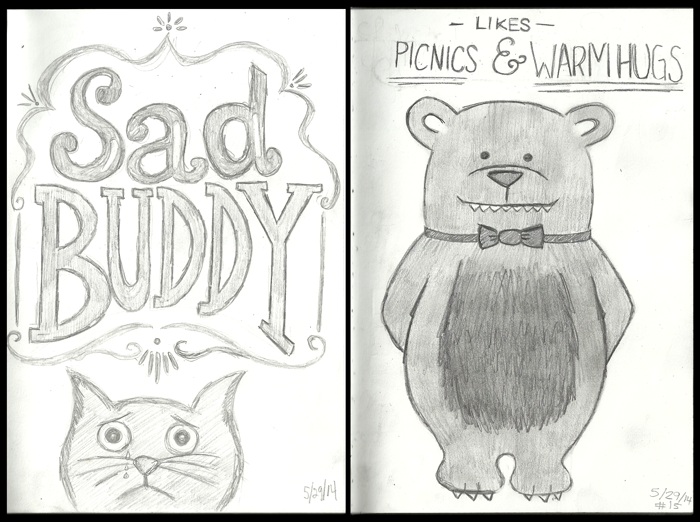 And here we are again with another Weekly Roundup on our summer sketches! Day 15: SAAAAAAD BUDDYYYYYYYY?! Hahaha. Sean incorporates some nice typography with an adorable drawing of my cat (who just happens to sound like he’s crying when he meows.) Stef, on the other hand, felt some lack of inspiration this day, so she shows off this fuzzy creature looking for a big warm bear hug. 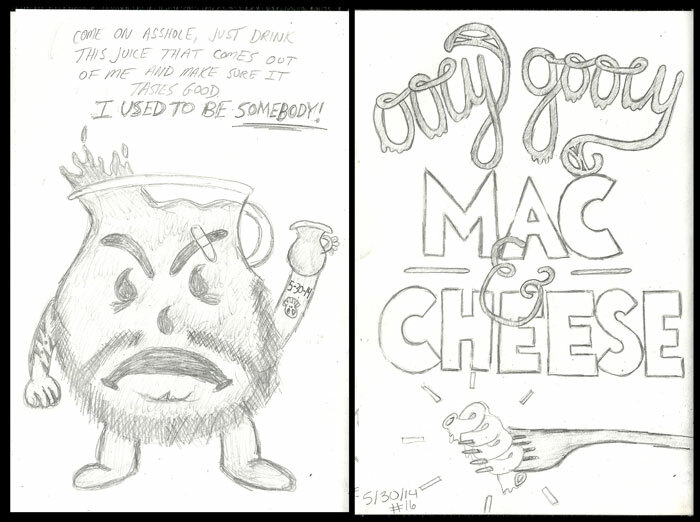 Day 16: Sean sure knows how to put some personality into his drawings with his grungy, unemployed Kool-Aid man with an attitude. Stef reminisces on the delicious dinner we made that day with some ooey gooey Mac & Cheese typography. 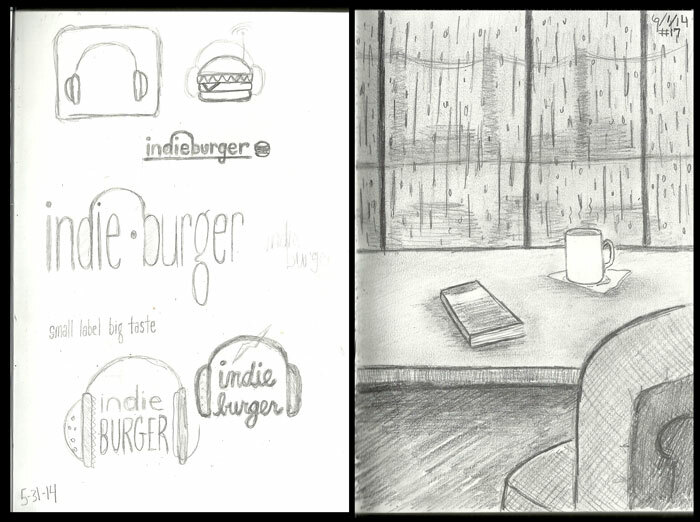 Day 17: Sean messes around with a logo idea (that will most likely be further developed in the future) for a burger joint that showcases indie bands while Stef captures the the feeling of being inside and looking out on a rainy day. 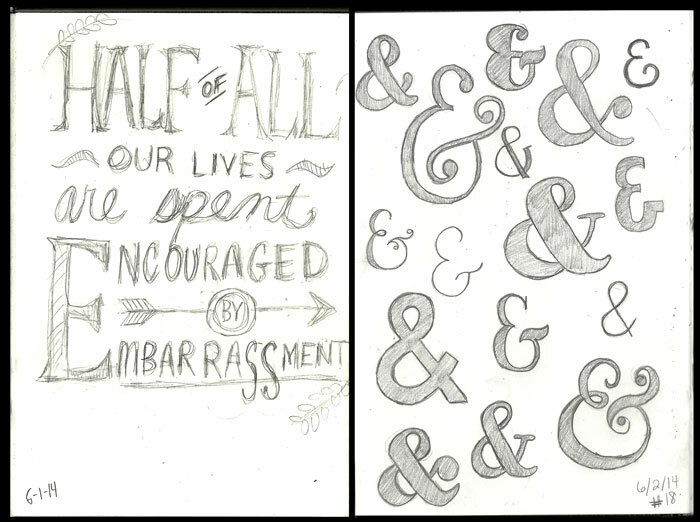 Day 18: Sean works with some more great typography today with some lyrics from one of his favorite artists, Matt Pond PA. Stef dedicates her daily sketch to a lesson on how to actually draw an ampersand. This was quite helpful. Day 19: PLAY BALL! Although today was not our themed sketch, we were both inspired by the Somerset Patriots game we had gone to earlier that night. 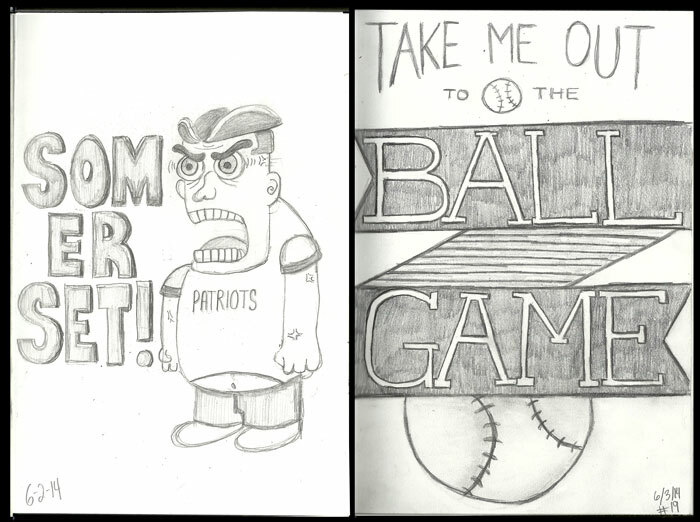 Once again, Sean hits it out of the ball park with his hilarious sketch of a dedicated Patriots fan who’s not afraid to scream for his team. Stef simply puts her own take on the popular “Take me out to the ball game” line by working with some typography and ribbon banners. Day 20: Wowee! Looks like someone is inspired by song lyrics. Once again, Sean shows some awesome typography with song lyrics from The Postal Service. 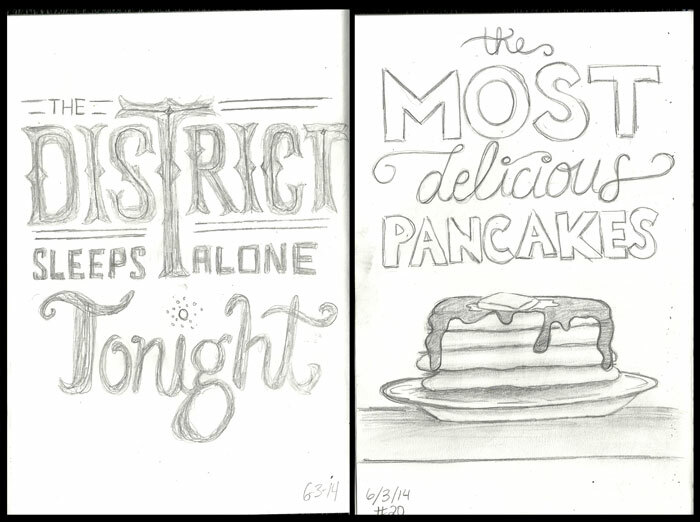 Stef, as usual, incorporates food into her sketch, with some delicious pancakes we made for dinner along with some stand-out typography to compliment it. Day 21: ***Theme : MUSTACHES! *** What an awesome theme (courtesy of Stef) to play around with this week. Sean takes the theme literally by sketching out a small, but tough looking outlaw who is nothing BUT mustache. 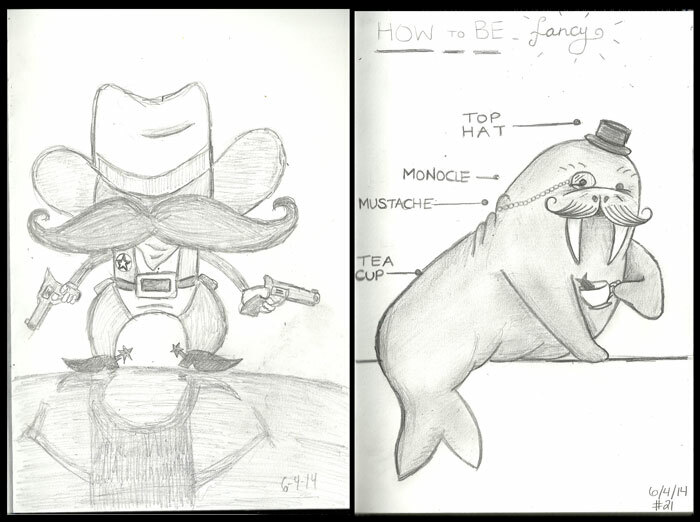 (Maybe the mustache hides his identity…) Stef takes a different spin on the idea by sketching out a quite dapper walrus, complete with top hat, monocle, mustache, and tea cup. Please, someone try being more fancy than him, I dare you. And that’s another wrap on an AWESOME week of sketches! I have to say, we really are getting better and better each day. The challenge of pushing our creativity each day is making the process a bit easier as well. I can’t wait to see where we take these sketches by the end of the summer. Tune in next Thursday for another round-up of sketches!